Our attorneys speak in our local community of Tampa, throughout the state of Florida and across the nation on legal topics that impact seniors, people with disabilities, caregivers and families. Our attorneys’ opinions are sought out on legal issues of state and national importance. You are welcome to join them each month for an Evening with the Attorney. Elder law is a complex area of law combining the different elements of estate planning with health care planning. Estate planning often involves the preparation of legal instruments such as Wills, Trusts, Durable Powers of Attorney and Advance Directives. Upon demise, estate administrations such as Probate or Trust Administrations may be necessary to transfer assets from one generation to the next. Don't wait to sign up and attend this event where you can ask your own legal questions of the experts. Light lunch to be served. Seating is limited. Light lunch to be served. Were you able to attend presentations on any of Emma's efforts fighting against the restriction on use of personal care contracts and spousal refusal together with trying to keep seniors from being included in the mandatory enrollment into for-profit, managed care plans to receive necessary Medicaid health insurance for their long term care needs, during the legislative session? 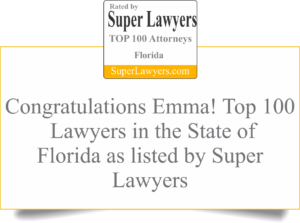 Emma shines as a tremendous, active advocate for Florida seniors. Our attorneys always welcome new opportunities to with with others in our community and beyond. If you are interested in having either attorney come speak to your organization, business or group just give us a call at (813) 661-5297 or fill out our contact form by clicking here to let us know.